1) “Value Judgments,” is the infamous unfilmed CRUSADE script featuring the return of BABYLON 5’s Alfred Bester. 2) “Tried and True,” features a one-on-one confrontation between Dureena and her Thieves’ Guild mentor, Mafeek of Tripani 7 (if the name sounds familiar, it’s because he was mentioned in BABYLON 5: A CALL TO ARMS). 3) “War Story,”is the first episode of an unfinished three-part story that would have seen Dureena abducted by a mysterious alien ship after a huge battle with the Drakh. There’s also “Ruling From the Tomb,” in which Captain Gideon and the EXCALIBUR crew seek to capture a murderer bent on derailing a conference seeking a cure for the Drakh plague. For this episode, we’ve also included writer Peter David’s original outlines, one featuring the return of a fan-favorite BABYLON 5 character who DID NOT appear in the finished episode. If you’ve ever longed for more than the thirteen produced episodes of CRUSADE this material will take you on a guided tour of the latter half of season one, showing you what might have been. Unrealized storylines including Lieutenant Matheson face-to-face with Alfred Bester, Dureena’s life in the Thieves’ Guild and Earthforce Marines in an all-out battle with the Drakh. The reason he added Max Eilerson to the story when the character was not present in JMS’s premise for the episode. How the Joan of Arc element found its way into the story. How a misremembered name from a Broadway musical led to the character called LeBecque. Which beloved BABYLON 5 character shared Max Eilerson’s sense of humor. Why Peter David was disappointed with the portrayal of Joan of Arc in the finished episode. How budgetary restrictions threw a monkeywrench in the wheels… er… hover mechanism of a skimmer chase across the Martian surface. Why the bomb’s countdown clock stopped at 018 (instead of James Bond’s preferred 007 or the even more cliched 001), and how that tied into the theme of the episode. How a writer who’d had no involvement with BABYLON 5 came to write an episode of CRUSADE. What parameters JMS established for the writing of the critical episode in which Dureena was to have been kidnapped. What historical naval battle informed his CRUSADE story and why. Which character he had to rein in lest they become the star of his episode. Why his script for “War Story” exists, even though he was never given the official go-ahead to write it. JMS’s handwritten notes for the episode that eventually became “Ruling From the Tomb,” which featured “MIKE,” A BRAND NEW CRUSADE CHARACTER who never made it to the screen. The premise JMS wrote for Peter David to work from in crafting “Ruling From the Tomb.” In it, you’ll learn how the cure to the Drakh plague would have been distributed once it was discovered, and why Dr. Chambers might have had a problem with the plan. The biography of IPX archaeologist Maximilian Eilerson written by actor David Allen Brooks, as well as a trio of poems (one R-rated) that he wrote from Max’s point of view. A May 2011 interview with Dureena Nafeel actress Carrie Dobro, where she describes her feelings about the two new Dureena-centric scripts featured in this volume that she had never seen before. Find out how she felt when she revisited the character after a dozen years. Three unused story ideas writer Richard Mueller pitched to JMS before landing the assignment to write “War Story.” Discover the secret of the Durkonans — a species that never gets sick — in “A Fire in the Blood.” Join Captain Gideon at a card game with potentially life-saving stakes in “House Odds.” Finally, “Mixed Blessings” finds the EXCALBUR crew stranded in an asteroid belt where Galen makes a startling discovery. These stories were never meant to be, but they’re here for you to see. A detailed synopsis of “The Walls of Hell” — an episode to be written by Larry DiTillio, the second part of a three-episode arc begun by Mueller in “War Story” and set to be concluded by JMS in an unwritten episode. Find out what happens when the Apocalypse Box possesses Lieutenant Matheson! And for fans of the EXCALIBUR’s infrastructure, there are FOURTEEN drawings of the bullet car, including detailed schematics of the tunnels it uses to speed through the EXCALIBUR. See exactly how much thought went into the intricate workings of this people mover. Though viewers never got to see the ins and outs of the bullet car network, now you can. Continuing with detailed looks at Captain Gideon’s starship, there are FIVE illustrations showcasing the EXCALIBUR’s fighter bay and the fast-launch system that delivers Starfuries into battle. See how the fighters were stored and launched aboard the ship in drawings that back up well-imagined stories with realistic environments. There are even EIGHT concept drawings charting the evolution of Dureena Nafeel’s makeup. You’ll see everything from an eyebrow-less Human look all the way up to some Narn-inspired forehead spots… and EVERYTHING in between. From the character files, we have a brief document written to help Carrie Dobro understand the background of Dureena’s nearly extinct species. How did they live? What did they use for weapons? Who or what did they worship? It’s all in this anthropological account that likens the inhabitants of Zander Prime to several ancient cultures on Earth. 1) The original order JMS intended to use before TNT started giving notes. See how JMS intended the series to run. 2) JMS’s revised watching order created to deal with the changes caused by TNT’s notes. Think of this as the Great Maker’s Plan B. 3) The sequence TNT used on CRUSADE’s first airing because they had not produced episode fourteen. See the series as it was screened for the very first time. 4) The Sci Fi Channel ordering. For those fans who want to understand why their friends who first saw CRUSADE on Sci Fi got so confused, this sequencing will explain how the eccentric 2001 airing order came to be. 5) The EXCALIBUR Calendar’s Chronological order (versus when they were written, filmed or aired), which makes sense of all the onscreen dates that appear in the series. 6) The Ultimate Viewing Order, 2011. 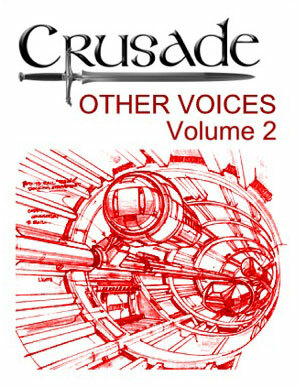 This sequence integrates the material in “Other Voices” Volumes 1 and 2 with EVERY PIECE of the CRUSADE storyline, from the finished episodes to unproduced scripts, outlines and notes. Following this combination of reading and viewing is the best equivalent to a complete first-season CRUSADE experience. Just got done reading it and I have to say I enjoyed it quite a bit. Max’s background is very dark and something I never really suspected. The War Story script looks amazing. After reading Value Judgements, I still have problems with it, but if lead to more Bester, I would be fine with it. I guess the third part of the Dureena arc is going to be in What the hell happened? or is there no written work done on it? All in All, a very good read. What’s on page 327 is all there is of the third and concluding part of the kidnapped Dureena storyline: two phrases scribbled on a list of upcoming stories. Yes, even though I don’t know if it could filled an entire 45 minute spot without a B story. I am very curious to see how they infiltrated the Minbari. To be honest, you mentioned it, but I tore through that thing I probably missed it.